Drug repurposing approaches for the treatment of influenza viral infection: Reviving old drugs to fight against a long-lived enemy. Pizzorno A, Padey B, Terrier O, Rosa-Calatrava M.
SPRi-based hemagglutinin quantitative assay for influenza vaccine production monitoring. Durous L, Julien T, Padey B, Traversier A, Rosa-Calatrava M, Blum LJ, Marquette CA, Petiot E.
Vaccine. 2019 Mar 14;37(12):1614-1621. doi: 10.1016/j.vaccine.2019.01.083. Epub 2019 Feb 14. Repurposing of drugs as novel influenza inhibitors from clinical gene expression infection signatures. Pizzorno A,Terrier O, Nicolas de Lamballerie C, Julien T, Padey B, Traversier A, Roche M, Hamelin ME, Rheaume C, Croze S, Escuret V, Poissy J, Lina B, Legras-Lachuer C, Textoris J, Boivin G and Rosa-Calatrava M.
Front Immunol. 2019 Jan 29;10:60. doi: 10.3389/fimmu.2019.00060. eCollection 2019. The non-structural NS1 protein of influenza viruses modulates TP53 splicing through the host factor CPSF4. Dubois J, Traversier A, Julien T, Padey B, Lina B, Bourdon JC, Marcel V, Boivin G, Rosa-Calatrava M and Terrier O.
J Virol. 2019 Mar 21;93(7). pii: e02168-18. doi: 10.1128/JVI.02168-18. Print 2019 Apr 1. OVX836 a recombinant nucleoprotein vaccine inducing cellular responses and protective efficacy against multiple influenza A subtypes. Del Campo J, Pizzorno MA, Djebali S, Bouley J, Haller M, Perez-Vargas J, Lina B, Boivin G, Hamelin ME, Nicolas F, Le Vert A, Leverrier Y, Rosa-Calatrava M, Marvel J and Hill F.
NPJ Vaccines. 2019 Jan 23;4:4. doi: 10.1038/s41541-019-0098-4. eCollection 2019. Influenza viruses production: Evaluation of a novel avian cell line DuckCelt®-T17. Petiot E, Proust A, Traversier A, Durous L, Dappozze F, Gras M, Guillard C, Balloul JM, Rosa-Calatrava M.
Vaccine. 2018 May 24;36(22):3101-3111. doi:10.1016/j.vaccine.2017.03.102. Epub 2017 May 29. PubMed PMID: 28571695. Role of p53/NF-kB functional balance in RSV-induced inflammation response. Machado D, Pizzorno A, Hoffmann J, Traversier A, Endtz H, Lina B, Rosa-Calatrava M, Paranhos-Baccala G and Terrier O.
J Gen Virol. 2018 Apr ; 99(4):489-500. doi: 10.1099/jgv.0.001040. Influenza A viruses alter the stability and antiviral contribution of host E3-ubiquitin ligase Mdm2 during the time-course of infection. Pizzorno A, Dubois J, Machado D, Cartet G, Traversier A, Julien T, Lina B, Bourdon JC, Rosa-Calatrava M, and Terrier O.
Sci Rep. 2018 Feb 27 ;8(1):3746. doi: 10.1038/s41598-018-22139-6. Development and pre-clinical evaluation in the swine model of a mucosal vaccine tablet for human influenza viruses: A proof-of-concept study. Busignies V, Simon G, Mollereau G, Bourry O, Mazel V, Rosa-Calatrava M and Tchoreloff P.
Int J Pharm. 2018 Mar 1;538(1-2):87-96. doi: 10.1016/j.ijpharm.2018.01.021. RSV infection in human macrophages promotes CXCL10/IP-10 expression during bacterial co-infection. Machado D, Hoffmann J, Moroso M, Rosa-Calatrava M, Endtz H, Terrier O, Paranhos-Bacala. Int J Mol Sci. 2017 Dec 7;18(12). pii: E2654. doi: 10.3390/ijms18122654. Generation of monoclonal pan-hemagglutinin antibodies against multiple strains of influenza. Manceur AP, Zou W, Marcil A, Paquet E, Gadoury C, Jaentschke B, Li X, Petiot E,, Durocher Y, Baardsnes J, Rosa-Calatrava M, Ansorge S and Kamen AA. PLoS One. 2017 Jun 29;12(6):e0180314. doi:10.1371/journal.pone.0180314. eCollection 2017. PubMed PMID: 28662134; PubMed Central PMCID: PMC5491208. Accelerated Mass Production of Influenza Virus Seed Stocks in HEK-293 Suspension Cell Cultures by Reverse Genetics. Milián E, Julien T, Biaggio R, Venereo-Sanchez A, Montes J, Manceur A, Ansorge S, Petiot E, Rosa-Calatrava M, Kamen A. Vaccine. 2017 May 8. pii: S0264-410X(17)30557-1. The NS1 protein from influenza virus stimulates translation initiation by enhancing ribosome recruitment to mRNAs. Panthu B., Terrier O., Carron C., Traversier A., Corbin A., Balvay L., Lina B., Rosa-Calatrava M. and Ohlmann T.
Petiot E., Proust A., Traversier A., Durous L., Dappozze F., Gras M., Guillard C., Balloul J-M. and Rosa-Calatrava M.
Vaccine. 2017 May 29. pii: S0264-410X(17)30502-9. doi: 10.1016/j.vaccine.2017.03.102. Mutations in the fusion protein heptad repeat domains of human metapneumovirus impact the formation of syncytia. Dubois J., Cavanagh M-H., Terrier O., Hamelin M-E., Lina B., Shi R.,Rosa-Calatrava M. and Boivin G.
J Gen Virol. 2017 Jun;98(6):1174-1180. doi: 10.1099/jgv.0.000796. Epub 2017 Jun 14. PubMed PMID: 28613142. Expression and purification of native and functional influenza A virus matrix 2 proton selective ion channel. Desuzinge Mandon E, Traversier A, Champagne A, Bernier L, Audebert S, Balme S, Dejean E, Rosa-Calatrava M and A Jawhari. Protein Expression and Purification. 2016 Nov 5;131:42-50. doi: 10.1016/j.pep.2016.11.001. Viral and bacterial co-infection in severe pneumonia triggers innate immune responses and specifically enhances IP-10: a translational study. Hoffmann J, Machado D, Terrier O, Pouzol S, Messaoudi M, Basualdo W, Espínola EE, Guillen RM, Rosa-Calatrava M, Picot V,Bénet T, Endtz H, Russomando G, Paranhos-Baccalà G.
Scientific Reports. 2016 Dec 6;6:38532. doi: 10.1038/srep38532. Critical phases of viral production processes monitored by capacitance. Petiot E, Ansorge S, Rosa-Calatrava M, and Kamen AA. Journal of Biotechnology. 2017 Jan 20;242:19-29. doi: 10.1016/j.jbiotec.2016.11.010. Immune signatures of protective spleen memory CD8 T cells. Brinza L, Djebali S, Tomkowiak M, Mafille J, Loiseau C, Jouve PE, Bernard S, Buffat L, Lina B, Ottmann M, Rosa-Calatrava M, Schicklin S, Bonnefoy N, Lauvau G, Grau G, Wencker M, Arpin C, Walzer T, Leverrier Y, and Marvel J.
Nucleolin interacts with influenza A nucleoprotein and contributes to viral ribonucleoprotein complexes nuclear trafficking and efficient influenza viral replication. Terrier O, Carron C, De Chassey B, Dubois J, Traversier A, Julien T, Cartet G, Proust A, Hacot S, Ressnikof D, Lotteau V, Lina B, Diaz JJ, Moules V and Rosa-Calatrava M.
Scientific Report. 2016 Jul 4;6:29006. doi: 10.1038/srep29006. Impact on antiviral resistance of E119V, I222L and R292K substitutions in influenza A viruses bearing a group-2 neuraminidase (N2, N3, N6, N7, N9). Gaymard A, Charles-Dufant A, Sabatier M, Cortay JC, Frobert E, Picard C, Casalegno JS, Rosa-Calatrava M, Ferraris O, Valette M, Ottmann M, Lina B and Escuret V.
Modulation of transcriptomic signature of the infected host: a new therapeutic strategy for the management of severe viral infections? Example of the flu. Poissy J, Terrier O, Lina B, Textoris J, Rosa-Calatrava M.
Reanimation 2016 March 25 (2016) S53-S61. Influence of HEK293 metabolism on the production of viral vectors and vaccine. Petiot E, Cuperlovic-Culf M, Shen CF, Kamen A. Vaccine. 2015 Nov 4;33(44):5974-81. doi: 10.1016/j.vaccine.2015.05.097. Epub 2015 Jun 11. Critical assessment of influenza VLP production in Sf9 and HEK293 expression systems. Thompson CM, Petiot E, Mullick A, Aucoin MG, Henry O, Kamen A.
BMC Biotechnol. 2015 May 16;15:31. doi: 10.1186/s12896-015-0152-x. Influenza viruses and mRNA splicing: doing more with less. Dubois J, Terrier O, Rosa-Calatrava M.
MBio. 2014 May 13;5(3):e00070-14. doi: 10.1128/mBio.00070-14. Trends Microbiol. 2014 Aug;22(8):446-55. doi: 10.1016/j.tim.2014.04.001. Epub 2014 May 2. Modulation of p53β and p53γ expression by regulating the alternative splicing of TP53 gene modifies cellular response. Marcel V, Fernandes K, Terrier O, Lane DP, Bourdon JC. Cell Death Differ. 2014 Sep;21(9):1377-87. doi: 10.1038/cdd.2014.73. Epub 2014 Jun 13. Ultrastructural fingerprints of avian influenza A (H7N9) virus in infected human lung cells. Terrier O, Carron C, Cartet G, Traversier A, Julien T, Valette M, Lina B, Moules V, Rosa-Calatrava M.
Virology. 2014 May;456-457:39-42. doi: 10.1016/j.virol.2014.03.013. Epub 2014 Mar 28. A functional sequence-specific interaction between influenza A virus genomic RNA segments. Gavazzi C, Yver M, Isel C, Smyth RP, Rosa-Calatrava M, Lina B, Moulès V, Marquet R.
Proc Natl Acad Sci U S A. 2013 Oct 8;110(41):16604-9. doi: 10.1073/pnas.1314419110. Epub 2013 Sep 25. Influenza NS1 interacts with p53 and alters its binding to p53-responsive genes, in a promoter-dependent manner. Terrier O, Diederichs A, Dubois J, Cartet G, Lina B, Bourdon JC, Rosa-Calatrava M.
FEBS Lett. 2013 Sep 17;587(18):2965-71. doi: 10.1016/j.febslet.2013.08.006. Epub 2013 Aug 13. Critical role of segment-specific packaging signals in genetic reassortment of influenza A viruses. Essere B, Yver M, Gavazzi C, Terrier O, Isel C, Fournier E, Giroux F, Textoris J, Julien T, Socratous C, Rosa-Calatrava M, Lina B, Marquet R, Moules V.
Proc Natl Acad Sci U S A. 2013 Oct 1;110(40):E3840-8. doi: 10.1073/pnas.1308649110. Epub 2013 Sep 16. Characterization of a key residue for hyperfusogenic phenotype in human parainfluenza virus type 2 (hPIV-2) fusion glycoprotein. Le Bayon JC1, Terrier O, Cartet G, Lina B, Rosa-Calatrava M.
Virus Genes. 2013 Oct;47(2):365-9. doi: 10.1007/s11262-013-0932-0. Epub 2013 Jun 8. Extracellular HSP27 mediates angiogenesis through Toll-like receptor 3. Thuringer D, Jego G, Wettstein G, Terrier O, Cronier L, Yousfi N, Hébrard S, Bouchot A, Hazoumé A, Joly AL, Gleave M, Rosa-Calatrava M, Solary E, Garrido C.
FASEB J. 2013 Oct;27(10):4169-83. doi: 10.1096/fj.12-226977. Epub 2013 Jun 26.
p53 protein isoforms: key regulators in the front line of pathogen infections? Terrier O, Bourdon JC, Rosa-Calatrava M.
PLoS Pathog. 2013;9(4):e1003246. doi: 10.1371/journal.ppat.1003246. Epub 2013 Apr 4. Host microRNA molecular signatures associated with human H1N1 and H3N2 influenza A viruses reveal an unanticipated antiviral activity for miR-146a. Terrier O, Textoris J, Carron C, Marcel V, Bourdon JC, Rosa-Calatrava M.
J Gen Virol. 2013 May;94(Pt 5):985-95. doi: 10.1099/vir.0.049528-0. Epub 2013 Jan 23. Innovative germicidal UV and photocatalytic system dedicated to aircraft cabin eliminates volatile organic compounds and pathogenic micro-organisms. Gorvel L, Yver M, Robert E, Harmant M, Rosa-Calatrava M, Lina B, Pierre Gorvel JP, Moulès V, Albalate R, Gaüzère C.
Interaction network linking the human H3N2 influenza A virus genomic RNA segments. Fournier E, Moules V, Essere B, Paillart JC, Sirbat JD, Cavalier A, Rolland JP, Thomas D, Lina B, Isel C, Marquet R.
Vaccine. 2012 Dec 7;30(51):7359-67. doi: 10.1016/j.vaccine.2012.09.079. Epub 2012 Oct 9. An in vitro network of intermolecular interactions between viral RNA segments of an avian H5N2 influenza A virus: comparison with a human H3N2 virus. Gavazzi C, Isel C, Fournier E, Moules V, Cavalier A, Thomas D, Lina B, Marquet R.
Nucleic Acids Res. 2013 Jan;41(2):1241-54. doi: 10.1093/nar/gks1181. Epub 2012 Dec 5. The influenza fingerprints: NS1 and M1 proteins contribute to specific host cell ultrastructure signatures upon infection by different influenza A viruses. Terrier O, Moules V, Carron C, Cartet G, Frobert E, Yver M, Traversier A, Wolff T, Riteau B, Naffakh N, Lina B, Diaz JJ, Rosa-Calatrava M.
Virology. 2012 Oct 10;432(1):204-18. doi: 10.1016/j.virol.2012.05.019. Epub 2012 Jul 6. Nucleolar localization of a netrin-1 isoform enhances tumor cell proliferation. Delloye-Bourgeois C, Goldschneider D, Paradisi A, Therizols G, Belin S, Hacot S, Rosa-Calatrava M, Scoazec JY, Diaz JJ, Bernet A, Mehlen P.
Sci Signal. 2012 Aug 7;5(236):ra57. doi: 10.1126/scisignal.2002456. Influenza A viruses control expression of proviral human p53 isoforms p53β and Delta133p53α. Terrier O, Marcel V, Cartet G, Lane DP, Lina B, Rosa-Calatrava M, Bourdon JC. J Virol. 2012 Aug;86(16):8452-60. doi: 10.1128/JVI.07143-11. Epub 2012 May 30. Post-mitotic dynamics of pre-nucleolar bodies is driven by pre-rRNA processing. Carron C, Balor S, Delavoie F, Plisson-Chastang C, Faubladier M, Gleizes PE, O'Donohue MF. J Cell Sci. 2012 Oct 1;125(Pt 19):4532-42. doi: 10.1242/jcs.106419. Epub 2012 Jul 5. Recent developments with live-attenuated recombinant paramyxovirus vaccines. Le Bayon JC, Lina B, Rosa-Calatrava M, Boivin G.
Rev Med Virol. 2013 Jan;23(1):15-34. doi: 10.1002/rmv.1717. Epub 2012 May 8. Ten years of human metapneumovirus research. Feuillet F, Lina B, Rosa-Calatrava M, Boivin G.
J Clin Virol. 2012 Feb;53(2):97-105. doi: 10.1016/j.jcv.2011.10.002. Epub 2011 Nov 9. The chicken chorioallantoic membrane tumor assay as model for qualitative testing of oncolytic adenoviruses. Durupt F, Koppers-Lalic D, Balme B, Budel L, Terrier O, Lina B, Thomas L, Hoeben RC, Rosa-Calatrava M.
Cancer Gene Ther. 2012 Jan;19(1):58-68. doi: 10.1038/cgt.2011.68. Epub 2011 Oct 21. A supramolecular assembly formed by influenza A virus genomic RNA segments. Fournier E, Moules V, Essere B, Paillart JC, Sirbat JD, Isel C, Cavalier A, Rolland JP, Thomas D, Lina B, Marquet R.
Nucleic Acids Res. 2012 Mar;40(5):2197-209. doi: 10.1093/nar/gkr985. Epub 2011 Nov 10. Measurement of enzymatic activity and specificity of human and avian influenza neuraminidases from whole virus by glycoarray and MALDI-TOF mass spectrometry. Pourceau G, Chevolot Y, Goudot A, Giroux F, Meyer A, Moulés V, Lina B, Cecioni S, Vidal S, Yu H, Chen X, Ferraris O, Praly JP, Souteyrand E, Vasseur JJ, Morvan F.
Chembiochem. 2011 Sep 5;12(13):2071-80. doi: 10.1002/cbic.201100128. Epub 2011 Jul 7. Protective role of protease-activated-receptor 2 against influenza viruses occurs through an ERK independent pathway : implication for new influenza therapy. Foucault ML, Moulès V, Ferraris O, Lina B, Rosa-Calatrava M, Riteau B. Importance of viral genomic composition in modulating glycoprotein content on the surface of influenza virus particles. Moulès V, Terrier O, Yver M, Riteau B, Moriscot C, Ferraris O, Julien T, Giudice E, Rolland JP, Erny A, Bouscambert-Duchamp M, Frobert E, Rosa-Calatrava M, Pu Lin Y, Hay A, Thomas D, Schoehn G, Lina B.
Virology. 2011 May 25;414(1):51-62. doi: 10.1016/j.virol.2011.03.011. Epub 2011 Apr 5. Cellular transcriptional profiling in human lung epithelial cells infected by different subtypes of influenza A viruses reveals an overall down-regulation of the host p53 pathway. Terrier O1, Josset L, Textoris J, Marcel V, Cartet G, Ferraris O, N'guyen C, Lina B, Diaz JJ, Bourdon JC, Rosa-Calatrava M.
Virol J. 2011 Jun 8;8:285. doi: 10.1186/1743-422X-8-285. Role for proteases and HLA-G in the pathogenicity of influenza A viruses. Foucault ML, Moules V, Rosa-Calatrava M, Riteau B.
J Clin Virol. 2011 Jul;51(3):155-9. doi: 10.1016/j.jcv.2011.04.013. Epub 2011 May 25. A new material for airborne virus filtration. Tiliket G, Le Sage D, Moules V, Rosa-Calatrava M, Lina B, Valleton JM, Nguyen QT, Lebrun l.
Chemical Engineering Journal 173 (2011) 341-351. Voies métaboliques, interactants cellulaires et virus influenza : le grand détournement. Josset L, Lina B, Rosa-Calatrava M.
Gene expression signature-based screening identifies new broadly effective influenza a antivirals. Josset L, Textoris J, Loriod B, Ferraris O, Moules V, Lina B, N'guyen C, Diaz JJ, Rosa-Calatrava M.
PLoS One. 2010 Oct 4;5(10). pii: e13169. doi: 10.1371/journal.pone.0013169. In vitro characterization of naturally occurring influenza H3NA- viruses lacking the NA gene segment: toward a new mechanism of viral resistance? Moules V, Ferraris O, Terrier O, Giudice E, Yver M, Rolland JP, Bouscambert-Duchamp M, Bergeron C, Ottmann M, Fournier E, Traversier A, Boule C, Rivoire A, Lin Y, Hay A, Valette M, Marquet R, Rosa-Calatrava M, Naffakh N, Schoehn G, Thomas D, Lina B.
Virology. 2010 Sep 1;404(2):215-24. doi: 10.1016/j.virol.2010.04.030. Purification of ribosomes from human cell lines. Belin S, Hacot S, Daudignon L, Therizols G, Pourpe S, Mertani HC, Rosa-Calatrava M, Diaz JJ. Curr Protoc Cell Biol. 2010 Dec;Chapter 3:Unit 3.40. doi: 10.1002/0471143030.cb0340s49. Hacot S, Coute Y, Belin S, Albaret MA, Mertani HC, Sanchez JC, Rosa-Calatrava M, Diaz JJ. Curr Protoc Cell Biol. 2010 Jun;Chapter 3:Unit3.36. doi: 10.1002/0471143030.cb0336s47. Cold oxygen plasma technology efficiency against different airborne respiratory viruses. Terrier O, Essere B, Yver M, Barthélémy M, Bouscambert-Duchamp M, Kurtz P, VanMechelen D, Morfin F, Billaud G, Ferraris O, Lina B, Rosa-Calatrava M, Moules V.
J Clin Virol. 2009 Jun;45(2):119-24. doi: 10.1016/j.jcv.2009.03.017. Epub 2009 Apr 29. Parainfluenza virus type 5 (PIV-5) morphology revealed by cryo-electron microscopy. Terrier O, Rolland JP, Rosa-Calatrava M, Lina B, Thomas D, Moules V.
Virus Res. 2009 Jun;142(1-2):200-3. doi: 10.1016/j.virusres.2008.12.017. Epub 2009 Jan 29. Engineering of a parainfluenza virus type 5 fusion protein (PIV-5 F): development of an autonomous and hyperfusogenic protein by a combinational mutagenesis approach. Terrier O, Durupt F, Cartet G, Thomas L, Lina B, Rosa-Calatrava M.
Virus Res. 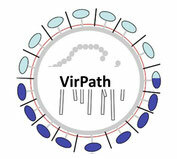 2009 Dec;146(1-2):115-24. doi: 10.1016/j.virusres.2009.09.009. Epub 2009 Sep 19. La génétique inverse chez les Paramyxovirus: applications et perspectives. Terrier O, Cartet G Lina B. The C-terminal domains of adenovirus serotype 5 protein IX assemble into an antiparallel structure on the facets of the capsid. Fabry CM, Rosa-Calatrava M, Moriscot C, Ruigrok RW, Boulanger P, Schoehn G.
J Virol. 2009 Jan;83(2):1135-9. doi: 10.1128/JVI.01808-08. Epub 2008 Nov 12.